How long do Artificial Rocks last? Originally tested by the CSIRO, Artificial Rocks tested very positively under normal weather conditions. Artificial Rocks will react to the weather the same as natural rock. Algae will grow and color may vary. How hard are Artificial Rocks to assemble? Can they be put into swimming pools? A few products in the range have been designed to overhang into a swimming pool (LW-003, CAVE-003, MW-002 and MW-003). If these are used, a 40mm water outlet fitting is required as the waterfall is hooked up to the pool pump and needs a larger outlet to accommodate the pressure. Ensure that the pump is turned off when using shock treatment as excessive chlorine can bleach rocks. How do Artificial Rocks compare with real rock? Artificial Rocks are lightweight, easy to move, durable and environmentally friendly. Natural rocks are heavy and often inaccessible, with heavy machinery required to transport them. This limits where you can position them. Natural rock can often crack over time due to contact with water. What do I do about algae? 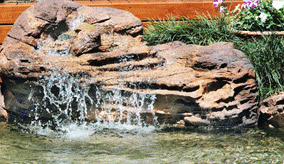 There are two types of ponds - clear water ponds and planted ponds. Generally, a clear water pond will grow algae quickly. Thankfully, there are natural anti-algae chemicals available. NOTE: Do not use chlorine in the pond as it will affect your pump very quickly and could bleach the rocks. Planted ponds are very popular, however to control the water quality, the ecology has to be set up correctly. Your pond size will determine the amount of plants and fish etc required. There are two main types of plants required when setting up your pond. Decorative plants: Lilies, water fringe, nardoo, water poppy etc. These plants obviously make your pond attractive and enjoyable, however they play a major role in the ecology of your pond. They provide surface cover for your pond. You need approximately 70% surface cover for your pond. If not, too much direct sunlight will cause rapid algae growth. Oxygenators: these are not decorative, they are working plants that grow beneath the water and control algae by competing for the nutrients in the water. The best oxygenators are Vallisneria and Elide. Oxygenators can be burnt by direct sunlight and benefit from the protection of decorative plants. There are many types of filter systems, such as biological and ultraviolet that can be used. The pump however is primarily used to circulate the water flow. It has a sponge in the end, which is a large particle filter and needs to be washed out regularly. The ponds can be emptied and scrubbed if necessary - the pump can be used to siphon water out by removing it from the waterfall outlet and redirecting it to a drain. Can I put fish and snails in a pond? Yes. Fish and snails play a vital part in maintaining cleanliness of a pond. The fish will eat the mosquito larvae and the snails are extremely good at cleaning the pond sides. Both these animals can be destructive if they breed to excess or grow too large. They can then start eating the plant life, which will cause the water to become dirty quickly.